Join us for the final event of this series for the spring 2019 semester! 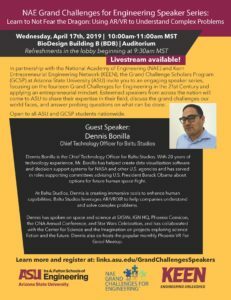 Dennis Bonilla, chief technology officer for Baltu Studios, will give a guest lecture “Learn to not fear the dragon: using AR/VR to understand complex problems,” on Tuesday, April 17, 2019! Livestream also will be available! In this talk, Mr. Bonilla will focus on the Grand Challenge of Enhancing Virtual Reality under the theme of joy of living. Dennis Bonilla is the chief technology officer for Baltu Studios. With 20 years of technology experience, Bonilla has helped create data visualization software and decision support systems for NASA and other U.S. agencies and has served in roles supporting committees advising U.S. President Barack Obama about options for future human space flight. At Baltu Studios, Bonilla is creating immersive tools to enhance human capabilities. Baltu Studios leverages AR/VR/XR to help companies understand and solve complex problems. He has spoken on space and science at SXSWi, IGN HQ, Phoenix Comicon, the ONA Annual Conference and Star Wars Celebration, and has collaborated with the Center for Science and the Imagination on projects exploring science fiction and the future. Dennis also co-hosts the popular monthly Phoenix VR for good meetup.